EARLIER this year, Bank Pembangunan Malaysia Bhd (BPMB) commissioned McKinsey & Co to come up with a roadmap. That set the 45-year-old development financial institution (DFI) back by millions but it was believed that, if followed, McKinsey’s proposals would put it on the right track or, at least, help it improve. “It’s not something alien, it (appointing companies such as McKinsey to do a study) has been done before in GLCs (government-linked companies) to set directions … They (McKinsey) took many months to do it and it cost millions (of ringgit) but it was a proper roadmap. Board approval was obtained and the scope was a transformation strategy and a look at the credit processes of the bank,” a source familiar with BPMB says. In a nutshell, McKinsey’s September report is damning and exposes many shortcomings at BPMB. Put another way, despite its 45-year history, BPMB has much to do. For instance, McKinsey highlights that BPMB has no proper treasury function nor does it have structured products in its portfolio. It adds that BPMB’s role should be aligned with the guiding principles of a DFI. Nevertheless, the report identifies six initiatives that could transform BPMB’s organisation and culture — developing leaders, reshaping the organisation, revamping the performance management system, boosting talent management, engaging staff and rebranding. Details are also given. It seems the structure of BPMB is geared towards value protection as opposed to an equal balance between value enablement and value protection. Some of the DFIs McKinsey looks at are Germany’s KfW, International Finance Corp of the World Bank Group, African Development Bank, Overseas Private Investment Corp, European Investment Bank, European Bank for Reconstruction and Development, and Inter American Investment Corp.
McKinsey’s plan involves BPMB’s providing a combination of banking and non-banking offerings in its portfolio. Other aspects it discusses include liquid coverage ratios and net stable funding ratios. It also suggests that BPMB’s overall participation in loan transactions be increased to RM35 billion to RM50 billion in the next five years — compared with RM16.7 billion from 2013 to 2017 — as part of a “significantly improved operating model”. BPMB also needs to build a leadership bench as some key positions — such as chief transformation officer, chief business officer and chief risk officer — are vacant. McKinsey identified five key themes for BPMB’s transformation, adding that BPMB does not have a clear strategic direction. There are no clear career paths within the company and deliverables are often not specified. Other key findings include low model effectiveness, poor quality of credit analysis and collateral valuation, and an absence of effective loan management systems for underwriting. There are inadequate early warning signals, ineffective credit-monitoring practices, a lack of prompt and meaningful corrective actions and primary financial recovery delays. Also in question are BPMB’s lacking of a comprehensive risk appetite framework and the gaps in risk mitigation, sector-specific guidelines and credit evaluation recommendations. 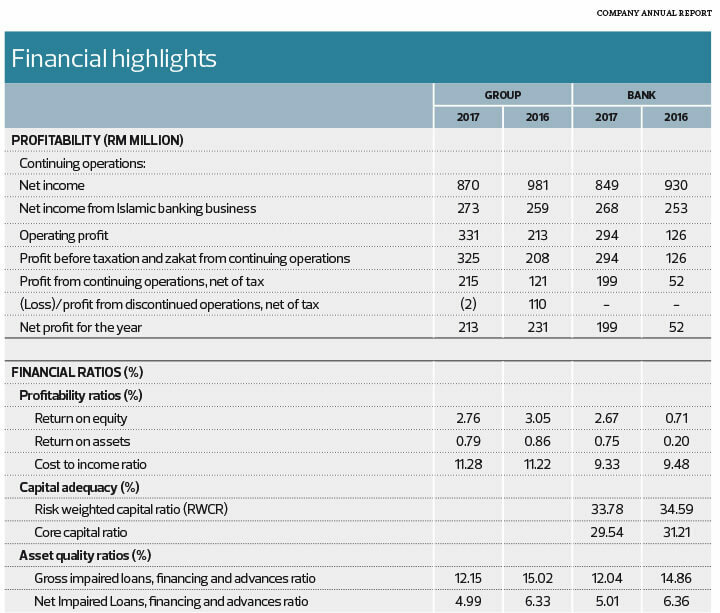 Also highlighted are Bank Negara’s grouses: weakness in initial credit analysis; lack of adequate stress-testing of cash flow as well as cost and demand projections; lack of sectoral understanding, as a result of which BPMB takes customers’ assumptions at face value; reviews are not being done promptly; and accounts are not being reclassified even after breaching triggers have sounded. Also an issue for the central bank is the lack of usage of third-party consultants and an overreliance on corporate guarantees. The report highlights a financial plan for 2019 to 2023, with annual revenues hitting RM1.15 billion and return on equity driven by growth in business and reduced non-performing loans (NPLs) of 5%, without additional capital required to be raised. On BPMB’s credit value chain, the consultancy highlights that the DFI faces a significant NPL burden of RM2.7 billion; has challenges in underwriting, especially in the tech, maritime and oil and gas sectors, which contributes more than 40% of NPLs; and needs to improve its recovery capabilities (with some RM2.3 billion worth of assets under recovery). McKinsey says BPMB’s NPLs have been constant at 10% to 12% while assets under recovery have slowly grown to RM2.3 billion. Nearly 95% of past due loans from 2015 to 2017 have moved to NPL, indicating a major need to improve monitoring and restructuring as well as rescheduling effectiveness. McKinsey also touches on creating value by attracting and inspiring top talent. However, it is not known whether the recommendations have been or will be considered.